Xavier Ireland is the assumed name of a radio-show host with a devoted following of listeners riveted by the sleepless loners who call in throughout the night to seek his advice. Off the air, he leads a low-key life of avoiding his neighbors, playing Scrabble, and maintaining an awkward friendship with his cohost, Murray. But his life begins to change when he meets a cleaning lady named Pippa, who becomes a constant, surprisingly necessary presence in his life as he starts facing up to his past and discovering solace and redemption in the most unexpected places. British comedian Mark Watson’s North American debut humorously and poignantly explores life and death, strangers and friends, heartache and comfort, and whether the choices we don’t make affect us just as powerfully as the ones we do. This reading group guide for Eleven includes an introduction, discussion questions, and ideas for enhancing your book club. The suggested questions are intended to help your reading group find new and interesting angles and topics for your discussion. We hope that these ideas will enrich your conversation and increase your enjoyment of the book. Late-night radio DJ Xavier Ireland is known throughout London for the poignant advice he gives to restless listeners. But his failure to help in a seemingly inconsequential run-in with a bullied boy sets off a chain of events that affects a cast of interwoven characters, from a bitter journalist to a love-struck barman. Haunted by memories of an accident that led him to leave his friends and family in Melbourne and take on a new identity, Xavier commits to not getting involved in the lives of others, save for his late-night callers. Xavier leads a lonely existence of Scrabble tournaments, avoiding his neighbors, and awkward chats with his co-host Murray, until a chance meeting with a cleaning lady named Pippa sets him on a new path. As Pippa tidies his apartment and brings him back to life, Xavier confronts his past and finds redemption in unexpected places. 1. Xavier Ireland’s name is derived from minutiae such as a high-scoring Scrabble word and his street address. What other seemingly insignificant details throughout the novel become increasingly significant? 2. Consider where the concept of “eleven” appears. In what ways is the number significant throughout the novel? 3. What role does London play in the novel? What do you think is the author’s commentary on modern city life? Consider where and how Watson draws the line between strangers and friends. 4. Discuss how much of Chris Cotswold still remains in Xavier. What would Chris think of his alter ego? 5. Discuss the theme of loss in Eleven, and how Xavier and Pippa each cope with loss and regret. What about their personalities draws them together? 6. In what ways is Xavier well suited for a job as a late-night radio DJ, and in what ways is his position ironic? 7. Discuss the symbolism of the Big Cheese mug at the radio station, and the dynamics of the partnership between Xavier and Murray. How do the men both comfort one another, and hold each other back? 8. Which characters appear to be socially unaware of the goings-on around them, and what are the consequences? Who do you feel is the most out of touch? 9. Consider all of the characters whose lives have been significantly altered—both positively and negatively—as a result of Xavier’s decisions. Who do you think has been most profoundly changed? 10. “He can’t look after everyone in London,” the author says of Xavier, yet he feels burdened with taking care of everyone from his co-host Murray to a homeless man on the street. What is Xavier’s attitude toward the underdog? In what ways is he an underdog himself? 11. Xavier says to Pippa, “People often overestimate how much difference they can make.” Pippa responds, “I think people underestimate it. You can change someone’s life without even knowing it.” In what ways does the novel illustrate both of these statements? Which philosophy prevails? Do you agree with one or the other? 12. In the sequence that begins with Xavier not helping Freddie Carstairs, which occurrence has the greatest impact on future events? Which characters had choices in the direction their lives took, and which ones did not? 13. Discuss the shift that occurred in Xavier after he finally opened “the vault” and thought about Michael’s accident. 14. How do you interpret the ending? What are the possibilities, and the ramifications of those possibilities? Tune in to a late-night radio show (or record one and listen to it the next day), and pay attention to how the DJs interact with callers. What conclusions can you draw about late-night listeners? Discuss in what ways it resembles Xavier’s job. Make a list of each character directly or indirectly affected by the chain reaction beginning with Xavier not helping Freddie Carstairs. Think of how each character could have reacted differently, and how it would have changed the subsequent events. Mark Watson is one of Britain’s most popular young stand-up comedians. Visit the author’s website, markwatsonthecomedian.com, and read the musings on his blog. 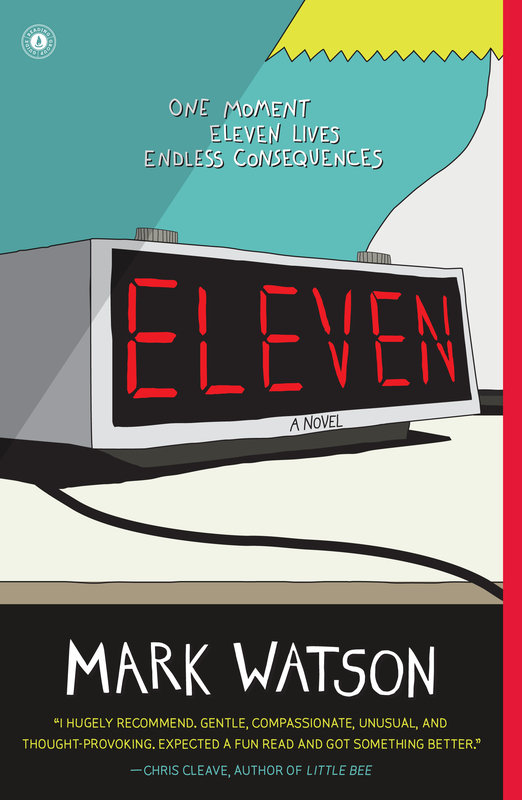 Discuss how his sense of humor comes into play in Eleven, and what elements of comedy permeate the novel. Mark Watson has been compared to authors from Nick Hornby to Vladimir Nabokov. Discuss which writers may have potentially influenced Watson’s style, and what similarities you see in their work. Mark Watson is one of Britain’s most popular young stand-up comedians. His comedy shows have won, among others, the Daily Telegraph Award, Time Out Best Stand-Up Award, Edinburgh Festival Panel Prize, and best shows at the Adelaide and Sydney Festivals. He has performed at every major international comedy festival and in more than twenty countries. He made comedy history at the Edinburgh Festival by performing for 24 hours, solo and without a break. He is a regular on many British TV shows and has his own highly successful BBC Radio 4 series, Mark Watson Makes the World Substantially Better. He is the author of the novels Bullet Points and A Light-Hearted Look at Murder, and the non-fiction title Crap at the Environment. Mark Watson lives in London. “I hugely recommend. Gentle, compassionate, unusual, and thought-provoking. Expected a fun read and got something better.” --Chris Cleave, author of "Little Bee"